Framagraphic is pleased to offer gift certificates for the holiday season. Any amount can be put towards a gift certificate, which is valid for either custom framing, decor pieces, or artwork. Gift certificates do not expire. This gift is a great way to give a loved one the chance to frame something they cherish. A much more common gift these days involves doing things together, as opposed to wrapping a large volume of ‘stuff’. People are gifting plane tickets – where families and friends can travel somewhere together, or going for dinner, attending a concert… the focus is more on spending quality time together. The pictures and mementos from these occasions make lovely items to frame. 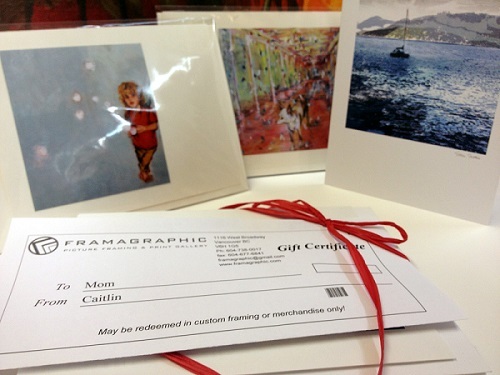 To ‘wrap’ your gift certificate, we have a selection of gift cards made by local artists. Ellen Scobie and Eri Ishii are two of the talented individuals who have crafted cards in the collection.